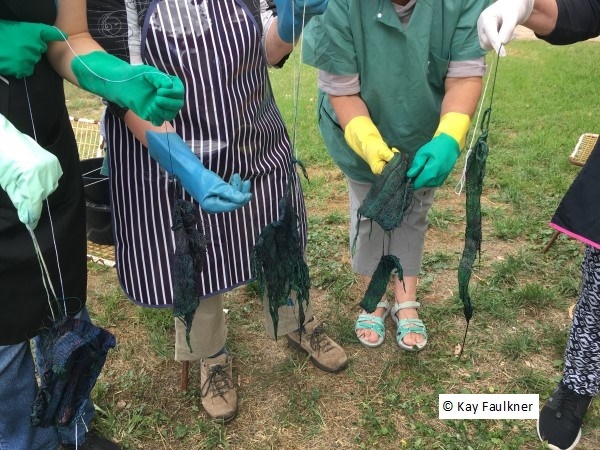 There has been two remarkable workshops this month. 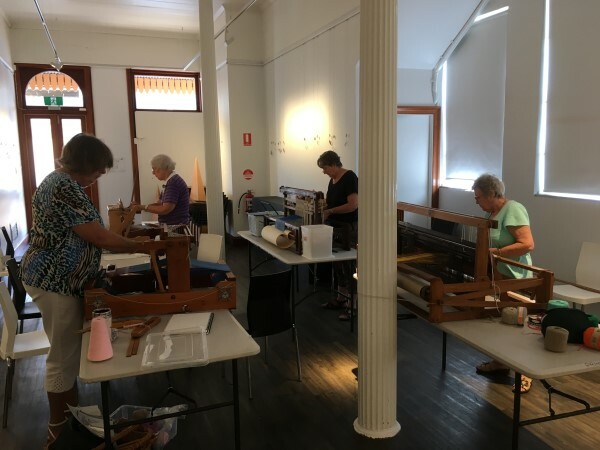 Gatakers in Maryborough hosted the first and a week later, the second was in my studio school. 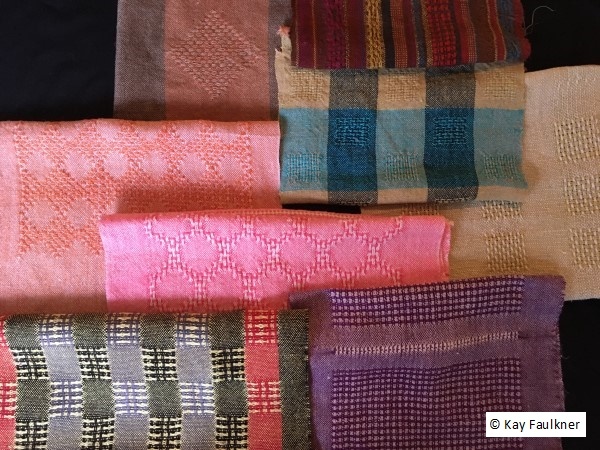 I am feeling very blessed to have spent time with both groups of weavers sharing their journeys of wonderment. 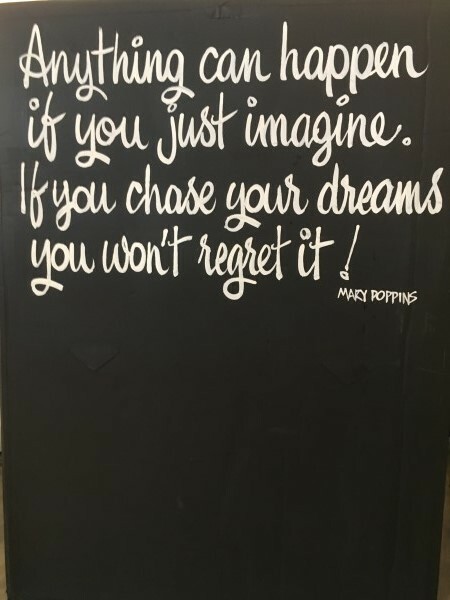 At Gatakers in Maryborough there was this sign in the studio. I thought that it was appropriate. Maryborough have laid claim to Mary Poppins as P L Travers, the author was born there. 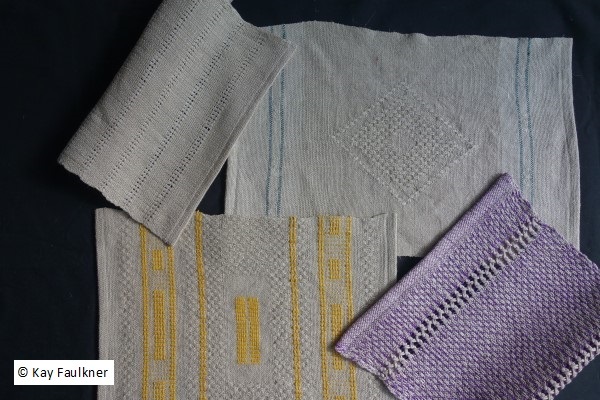 In the studio there were four weavers: one was a beginner and the other three explored aspects of double weave. I’d like to share their journeys. Gloria is now a weaver. In five days she explored structure, colour interplay and some finger manipulated techniques. 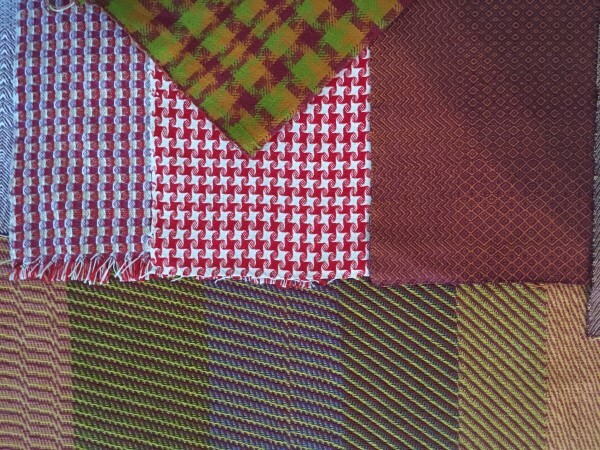 She started from never having threaded a loom to this. 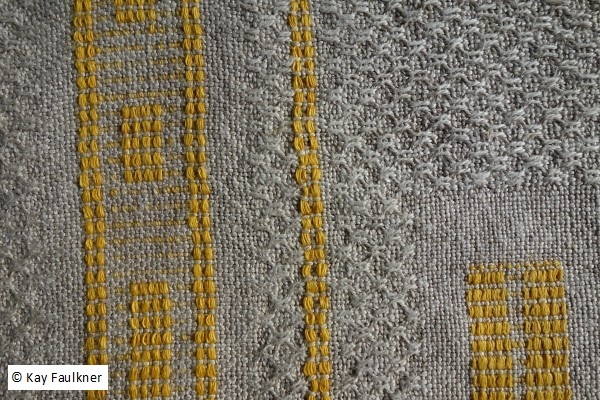 The three weavers doing double weave each had a different threading. The first few days was spent exploring some basics. Then each worked on their individual areas of study. It was great having the three different threadings as each weaver could learn from the others. Anne wanted to explore aspects of pick up. Karen explored structure on different layers. 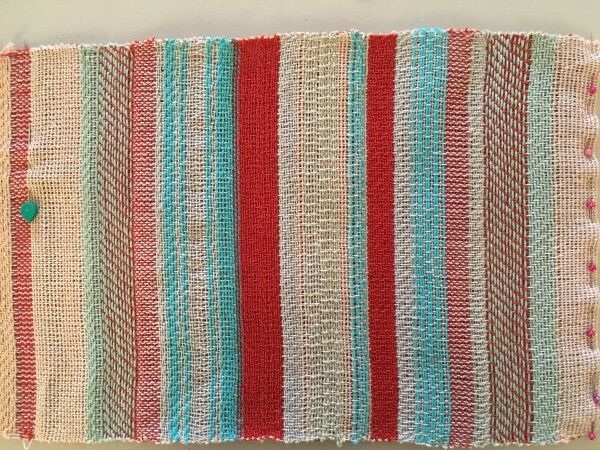 She even completed a small project with a complex interplay of colour, twills of different balance and supplementary wefts. 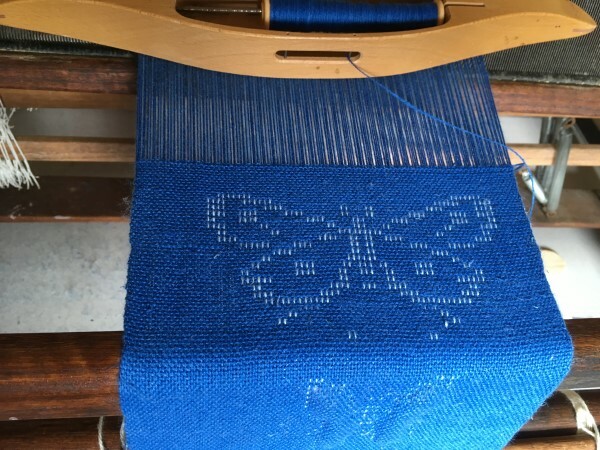 All the activity is on the front while the back is just plain weave. 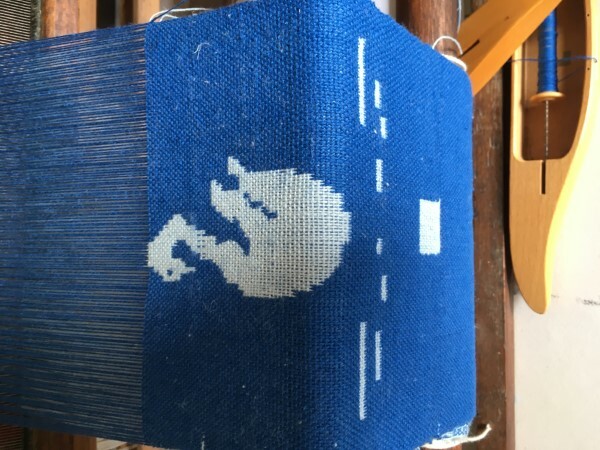 Chris explored double weave blocks. 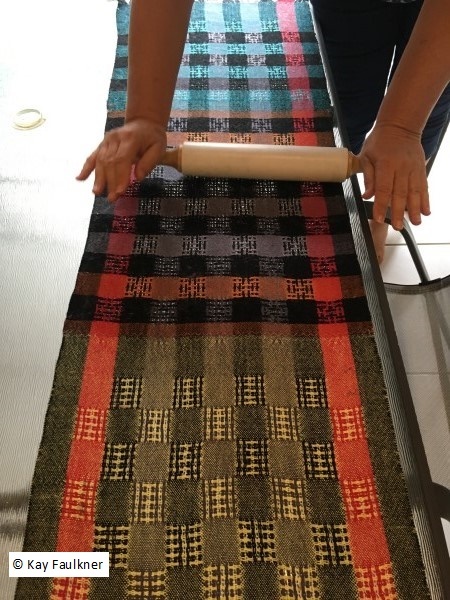 As her blocks were very small she could also play with warp and weft floats. It was a very special week. Here’s an overview of what they achieved. 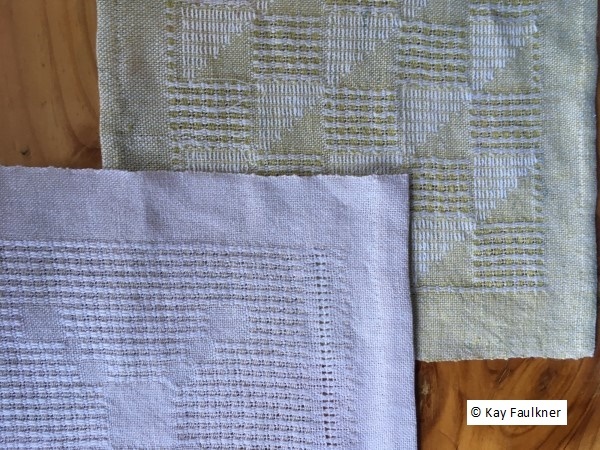 The following week there were two students in the studio exploring “From a Twill Threading”. I’d set up the looms to explore different aspects. It’s always interesting to see what aspect excites and where the development of ideas takes them. 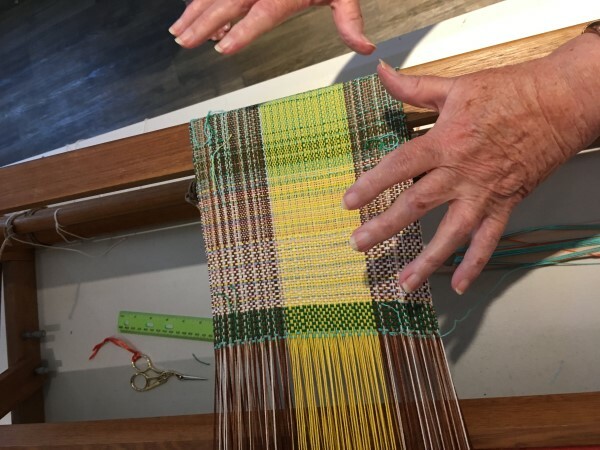 Sue was a new weaver while Jennie had more experience. There were some basic techniques to be covered but also time to explore “What if?”. According to Jennie she really appreciated what she called “thinking time”: yes there was plenty of theory. 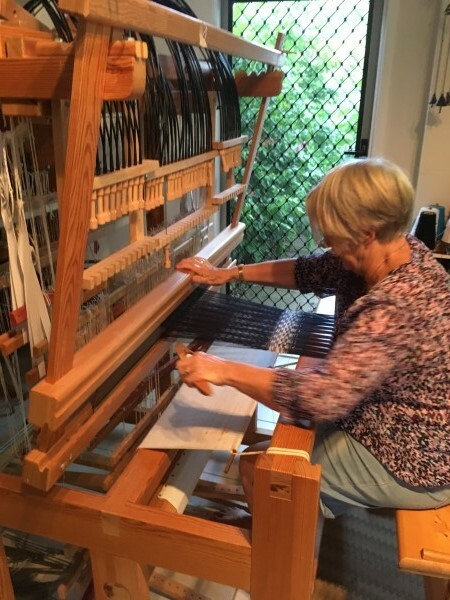 Sue weaving corkscrew twills on a parallel threading. 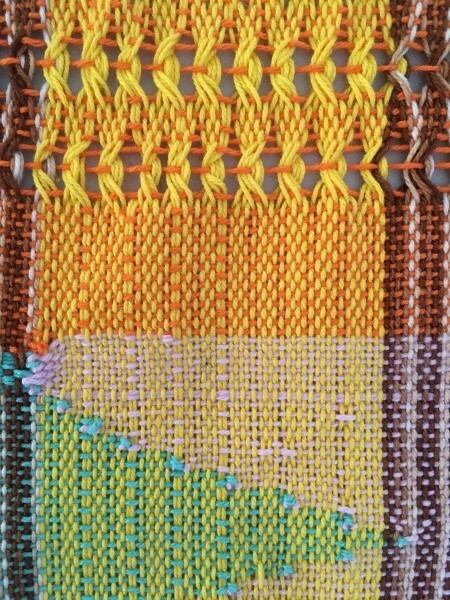 Jennie weaving twill blocks with colour interplay. 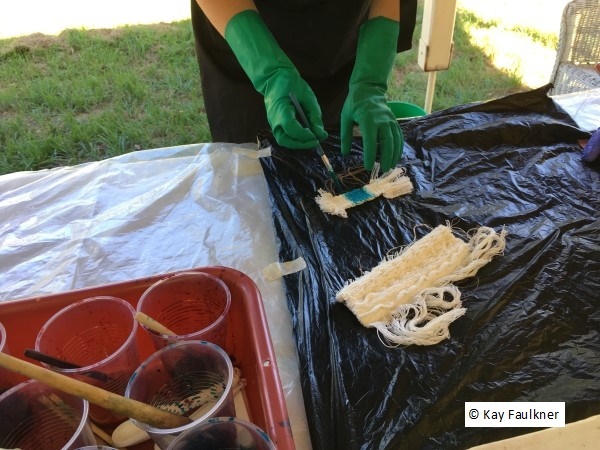 I’ve included some close ups of their work because I found what they chose to do fascinating. You might too. Unfortunately I didn’t take many close up details of Jennie’s work. She had to leave early and rushed out the door. 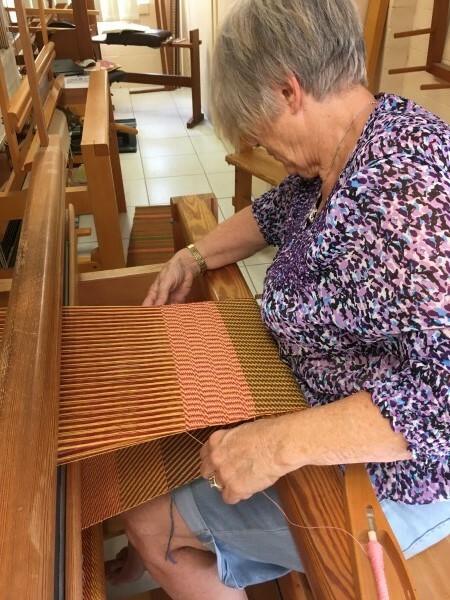 At 4.00 on the last day, Sue ( a beginner weaver) decided that she’d really like to try the draw loom. 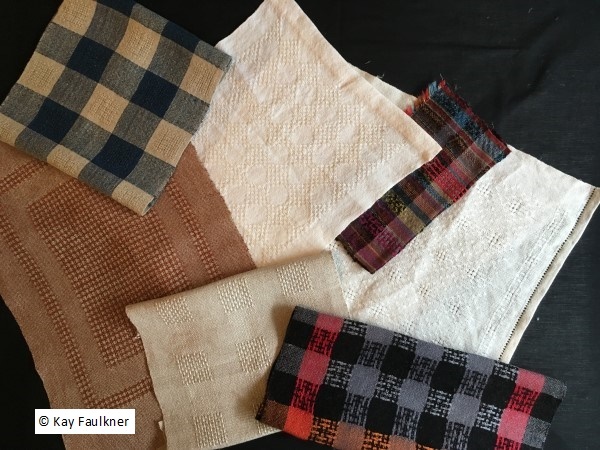 She found it a fascinating experience choosing what to do with her blocks of twill. And yes, Sue put into practice what she’d been playing with and went “back and forward”. Random blocks she called this. 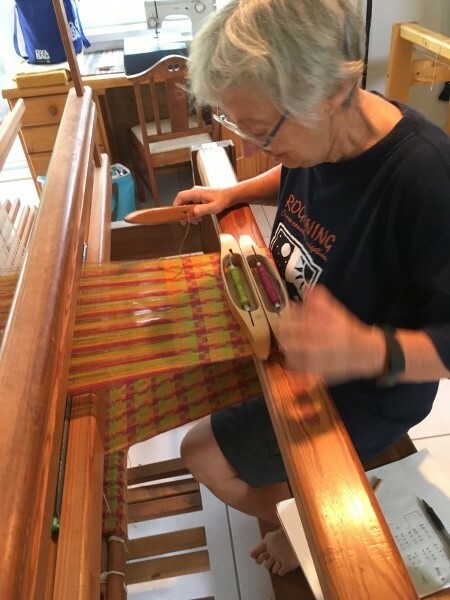 It’s great to see someone on a loom that looks complicated but makes sense when she weaves on it. It truly has been a remarkable two weeks. 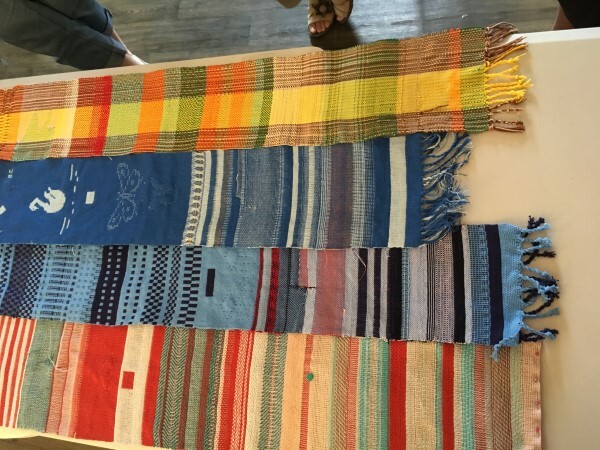 Congratulations to all weavers! Next month in the studio, the next class is “Beyond the basics”. 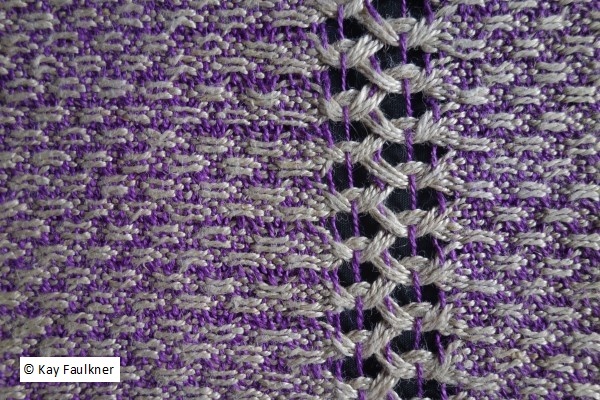 We’ll explore profile drafting and converting them into classic weave structures. There’s one place left. 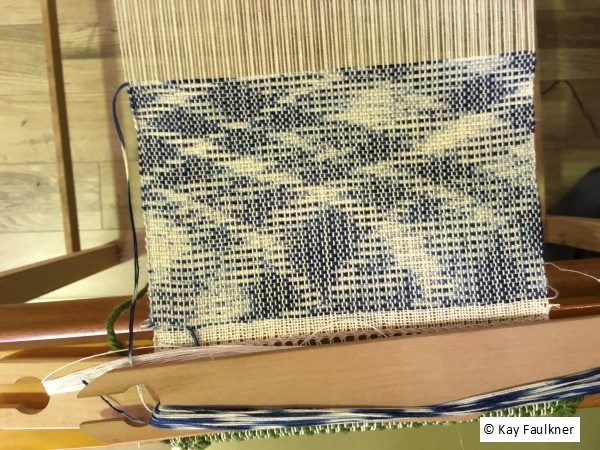 February 2018: Linen and Lace, Woven Shibori and other stuff. In the studio this month I held the second Linen and Lace class. The class was nearly full with 4 students. That is why this follows on from #1 in January. There were great results again. Here are some images of work by Karen, Jen and Jan. 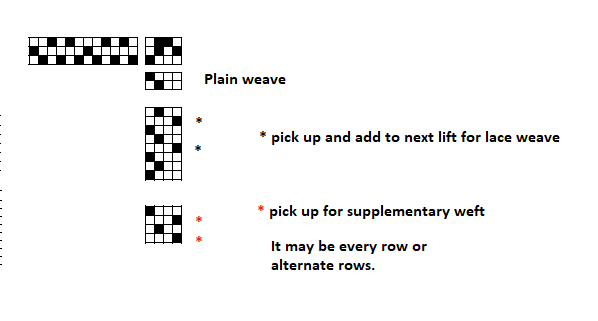 It is worthwhile to note that two of these are fairly new weavers. 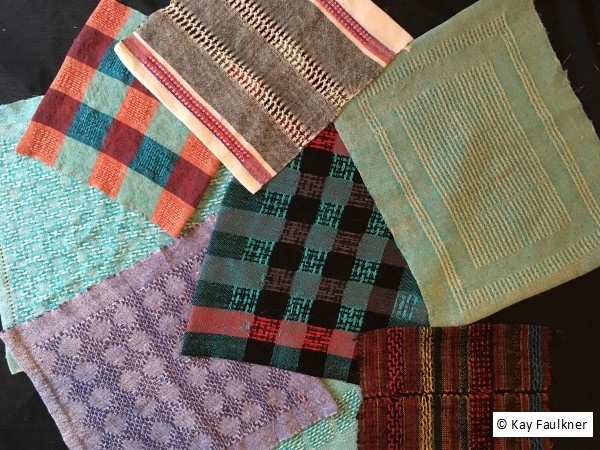 They wove. Karen is missing from this photo. And they finished off. Here a Swedish Lace series is being mangled using a marble rolling pin. And went home with a great collection. Rochelle after attending #1 decided that she’d like to weave a double width alpaca blanket, so she had the opportunity to also refresh on the theory… and to check out what the others did. 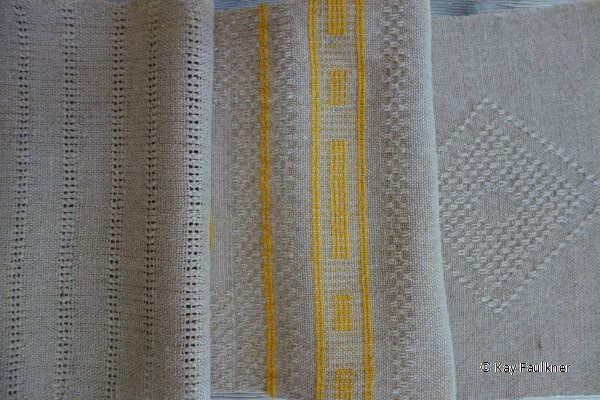 One of the additional challenges of this week was to experiment with pick up on lace weaves if time permitted. In this way all could come to an understanding that more complex design could be achieved with minimal shafts. There are some projects in both Jen and Jan’s collection. 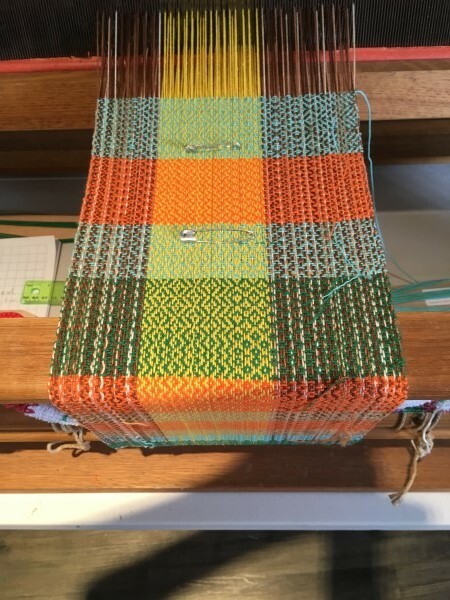 Having the loom threaded that way also allowed me to play with a couple of combinations both while the class was underway and afterwards. 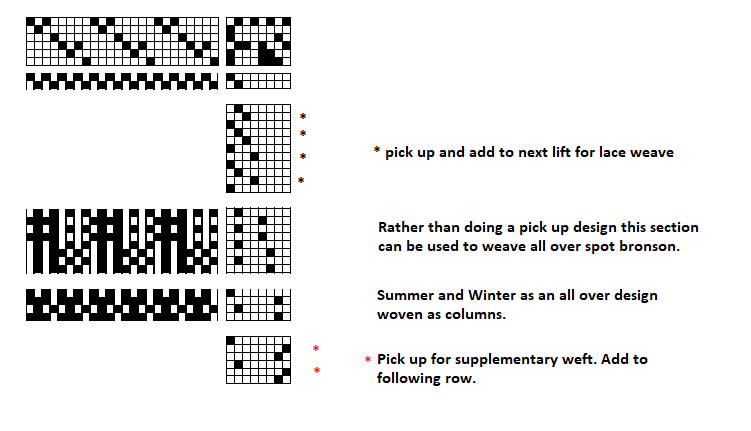 On the Bronson Lace warp students could accomplish pick up of a design for an overall pattern or combine it with inlay. 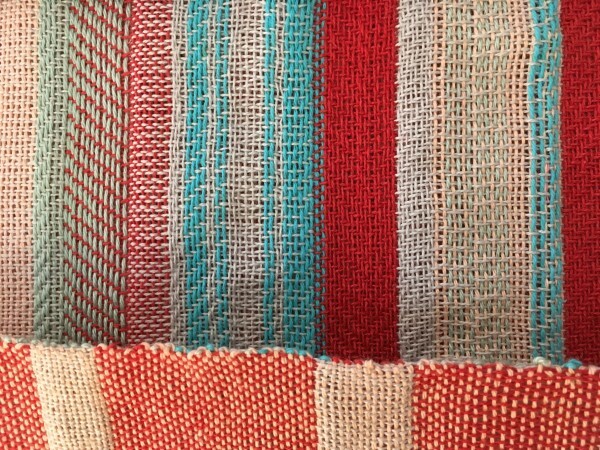 I got to weave these two examples. For those interested in drafts, here it is. The other pick up warp was on Spot Bronson. 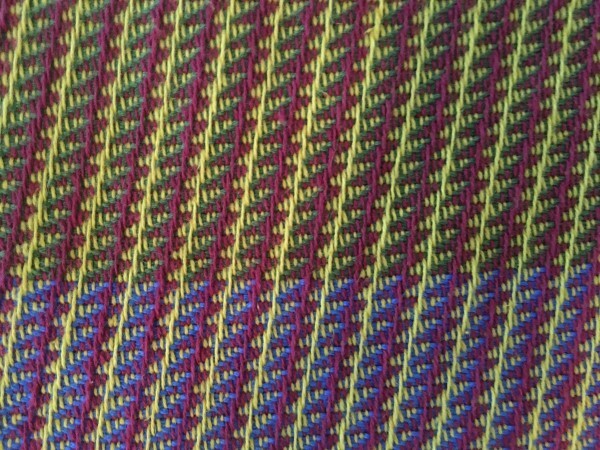 Jen got to weave a complex spot Bronson design while I got to play with combinations afterwards. This is my playtime, all off the one warp. 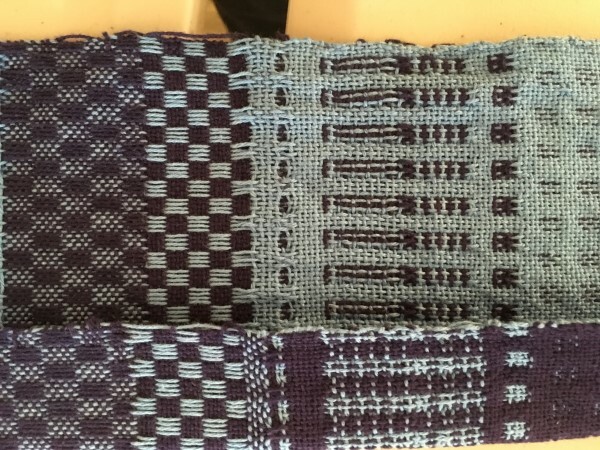 I threaded that one so that both lace and Summer and Winter could be woven at the same time. 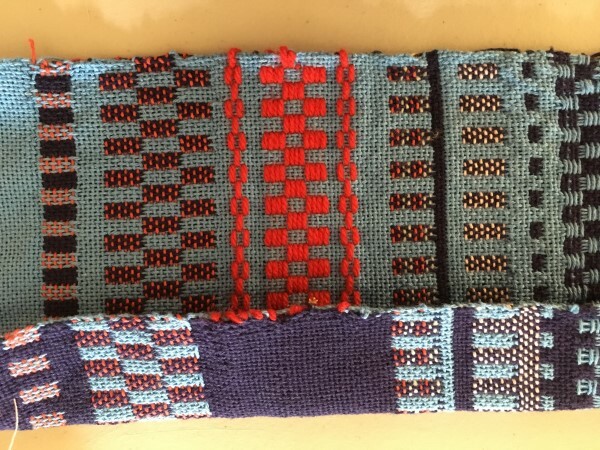 Jen got to weave a complex spot Bronson design while I got to play with combinations afterwards. I also wanted to revisit the experimentation I’d done with doupe leno from the previous workshop. So it was a 3 way challenge and a bit of forward planning was required. Spot Bronson and Summer and Winter combined. 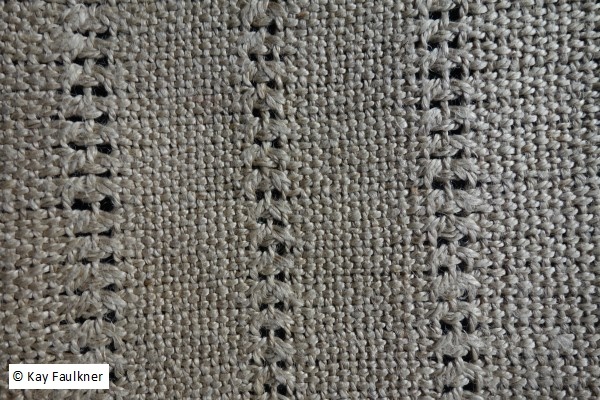 Note as well as being woven full width, there’s an isolated motif in the middle of the lace weave. To weave the leno, I required a group of 4 threads per dent if I was going to explore more doupe leno stored on an additional stick. 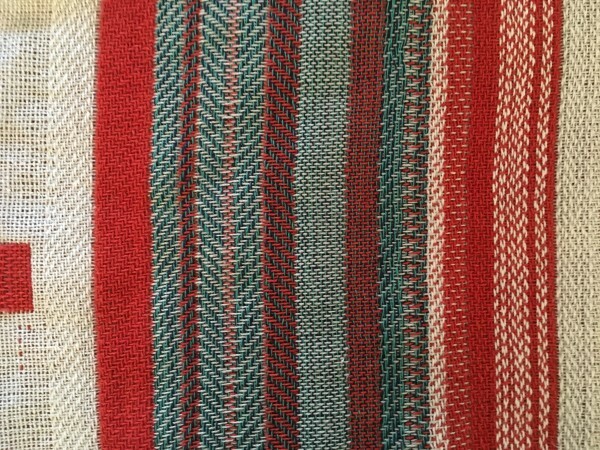 My aim was to compare the method that I’d used in the previous month on a countermarche loom with this on the jack loom. 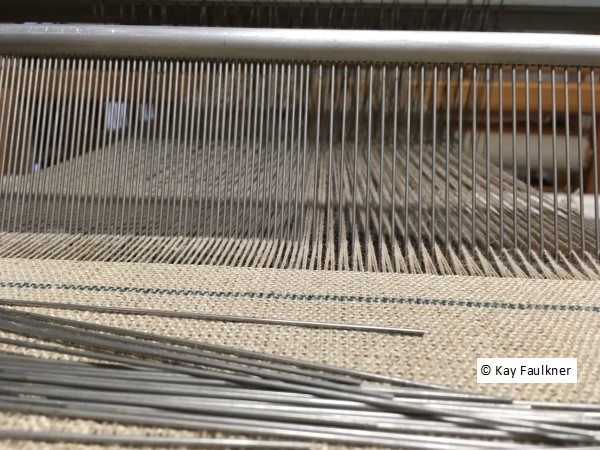 However the loom had been threaded 2 per dent. 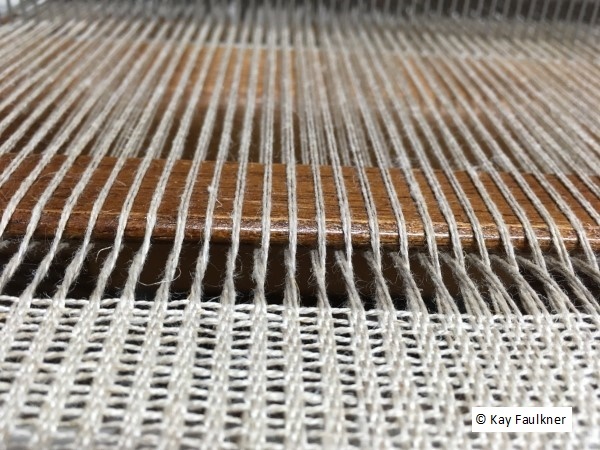 As I knew that I’d be taking advantage of this warp I used a reed where I could remove the uprights allowing me to maintain the sett while achieving 4 per dent. Part way through increasing dent size. An overhead view of this reed. Once I’m finished, I slide the brass strip back into place securing the reed. This image shows the leno being picked up. 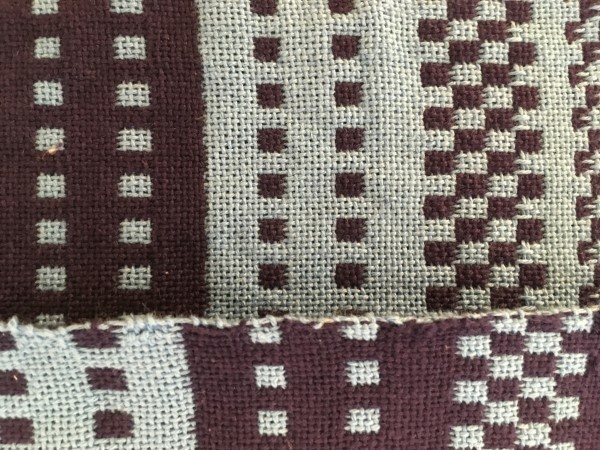 Note the wider spacing has also grouped four threads across in the plain weave. Preparing one group of 4 to be placed on a doupe. More about this process can be seen on January’s post. 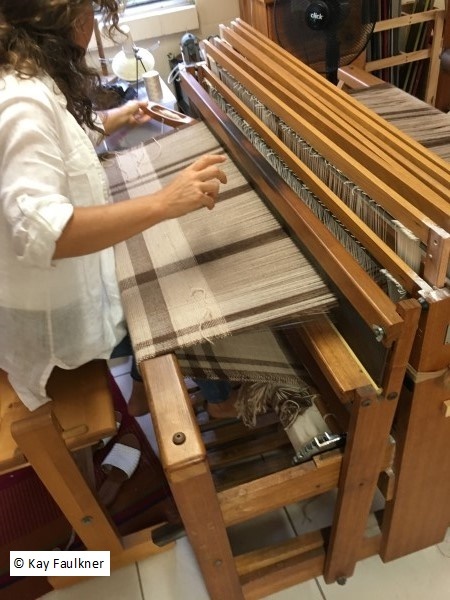 I found this process much easier to weave on the Jack loom. 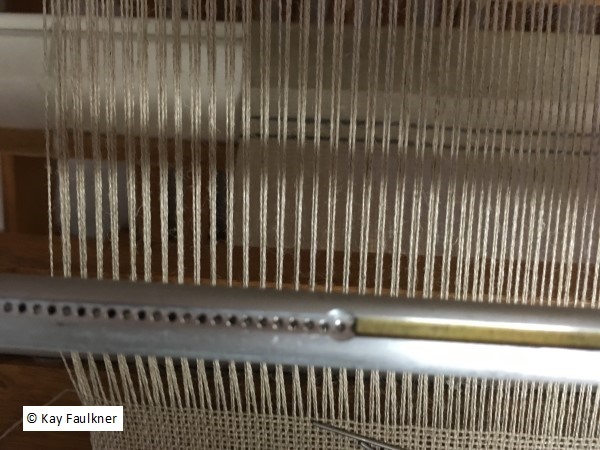 The important thing to remember is to put light tension on the pick up leno shaft as each row is woven. It prevents doupes being caught as the shafts change. On modifying my reed spacing: One might ask why I just didn’t use a reed with wider spaces to start with. 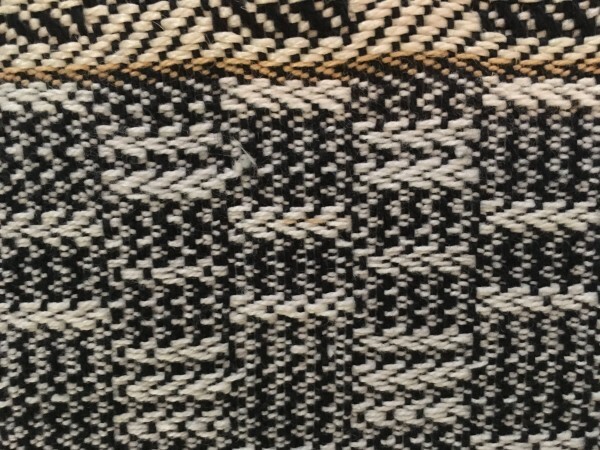 So for the last experiment, I also wove a piece with leno (pick up alternating) and Spot Bronson as an all over pattern. 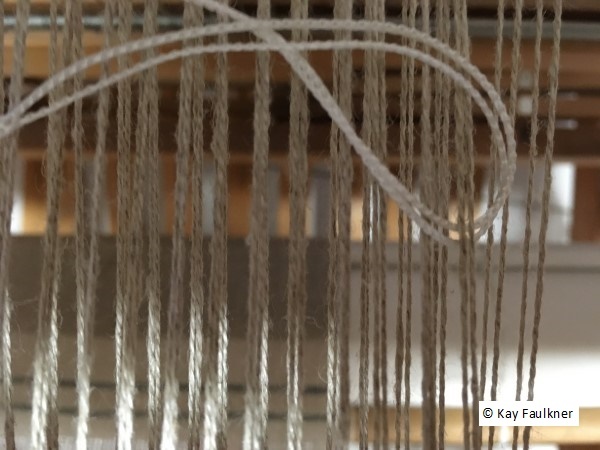 While weaving the threads were very much isolated in groups of 4. 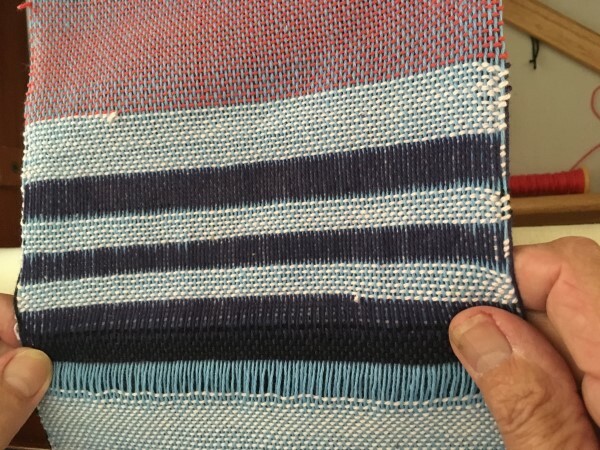 After finishing, the warp threads are more evenly spaced. 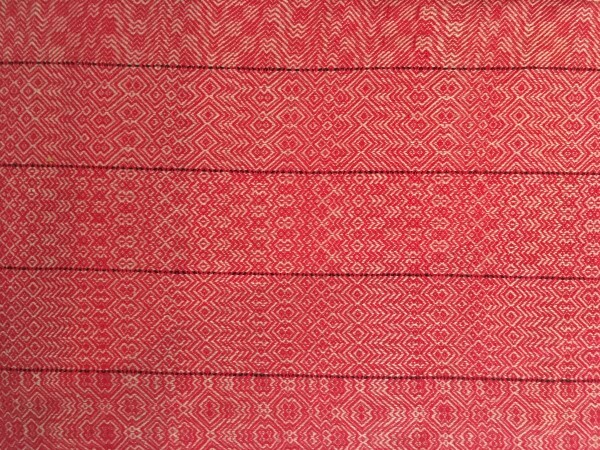 However while weaving, because of the denting, it was impossible to beat the fabric to square as a result the lace floats are elongated. Here’s the finished collection from that experimental warp. 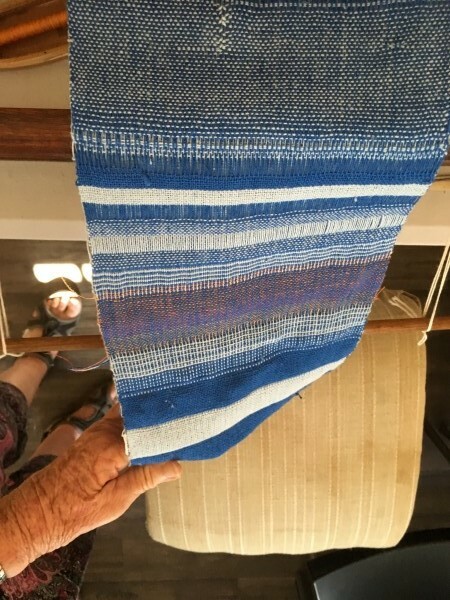 At the end of this month I was invited to teach at a weaving retreat for 5 weavers at Sewjourn, just north of Melbourne. 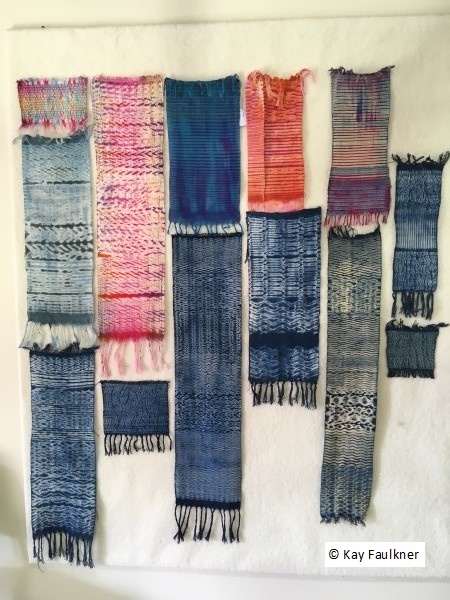 They had chosen woven shibori as the focus for their study with a bit of additional dyeing tossed in. 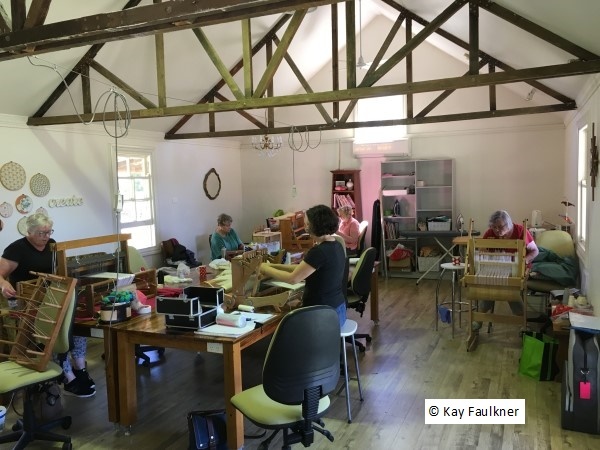 Sewjourn is a perfect location for a small group. It has well set up and basic accommodation where you self- cater and a great studio space, set in a rural location. Those weavers sure can cook! It was an amazing 5 days. Congratulations to Trudi, Di, Jillian, Elizabeth and Kaye. Here are some images. The studio. 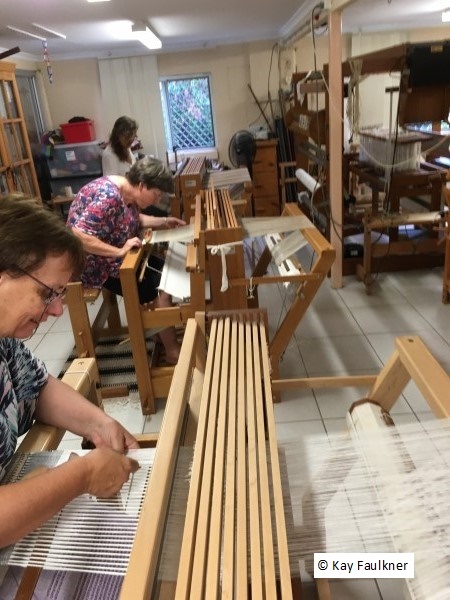 Weavers hard at play (aka work). 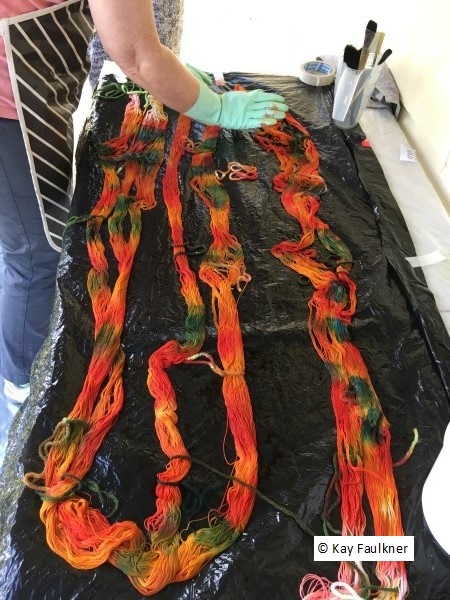 Some fibre reactive dyeing both as painted warps and pulled up woven shibori. Different shades of blue from the indigo bath. 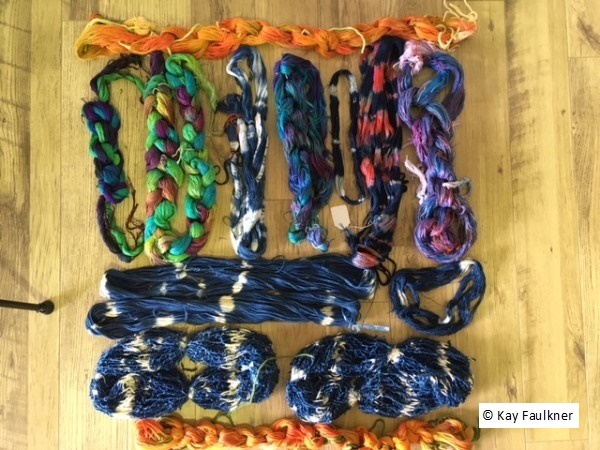 Completed dyeing of warps (painted and ikat) and small skeins for weft ikat. 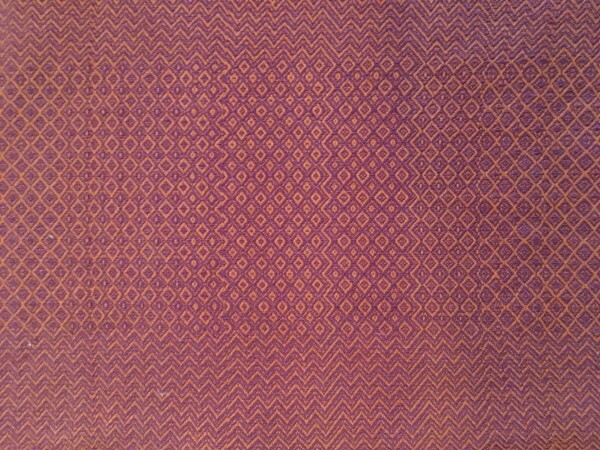 A weft ikat being woven. 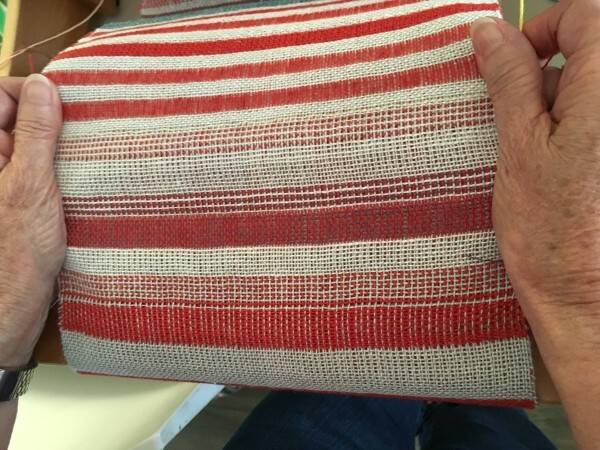 While the focus was on woven shibori, it was too good an opportunity to see how this would weave up. The result of a fabulous five days of play. 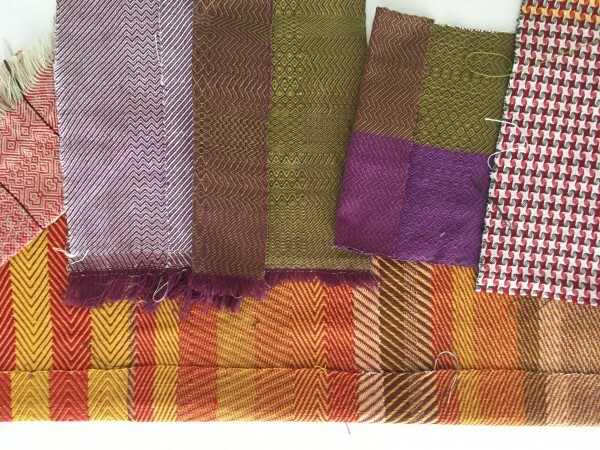 Next month: In the studio there will be a 5 day class focusing on all manner of twills. There are still 2 places available. You are currently browsing the Kay Faulkner's Blog blog archives for March, 2018.